Opening titles:- “1194 A.D. – England is a troubled land. King Richard the Lion Heart is a prisoner in Germany, with but half his ransom is paid. At home, his brother, Prince John, is intriguing to obtain the Crown himself. In the County of Nottingham Robin Hood and his outlaw band take toll from rich travellers – and it is a brave voyager indeed who ventures through Sherwood Forest. 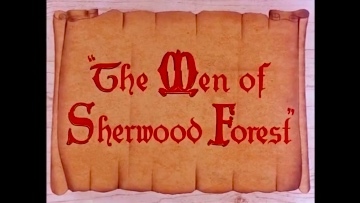 Hammer’s first colour production visits territory they would return to on two more occasions – in “Sword of Sherwood Forest” (1960) and “A Challenge for Robin Hood” (1967). ”Carry On” regular Bernard Bresslaw appears here in a small role. He later starred in Hammer’s 1959 Jekyll and Hyde comedy, “The Ugly Duckling” and in “Moon Zero Two” (1968). John Hollingsworth remained as chief Musical Director at Hammer for the next nine years.